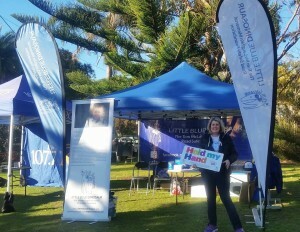 Last Saturday, June 25th, the Little Blue Dinosaur attended the Central Coast’s 10th annual 5 Lands walk. 5 Lands is a community based multicultural festival along 10km of spectacular coastline. The event showcases a collection of visual artists, performers and some pretty amazing sculptures. 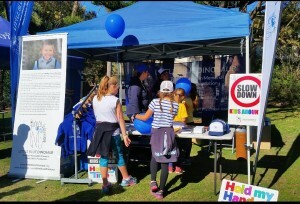 The event is always a fantastic opportunity for us to get out into the Central Coast community to discuss our road safety initiatives and find out what more we could be doing to make their roadways safer for children. The Little Blue Dinosaur has a deep connection with the Central Coast as it was the place where Tom’s tragic accident occurred. The Central Coast Council and community have been incredibly supportive in implementing our campaign in beach hamlets right across the region. Luck was in our favour on Saturday and we had sunny blue skies for the entire day. The Central Coast was on display in all its glory despite the region being battered with floods only weeks ago. We were stationed at Avoca Beach with a number of other not-for-profits and community groups, highlighting some of the amazing community work being done for residents and visitors to the area. We had a great time meeting local road-safety-conscious families, catching up with our regular supporters and showing some of our new road safety signage to the community. We would like to thank the Community Event organiser Dan Czura and his entire team for putting on such a great event for the Central Coast.